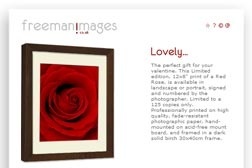 This was a personal project, developed to promote a limited edition, red rose print. The site was developed and launched for valentine's day 2006. The online payment facility has since been de-activated. The plan is to use the site to promote further works in the future.